What is "Uranami," and How Useful is it? The term, "uranami," is the literal pronunciation of the two-word Japanese technical term "裏波." "Ura" literally means, "reverse side," and "nami," "ripples." 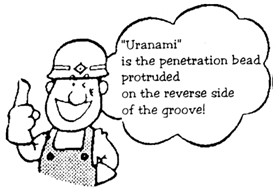 "Uranami" is used to describe the penetration bead protruded on the reverse side of the groove when welded from the face side of the groove (one-side welding without backing materials) — Fig. 1. Fig. 1 — The uranami is the penetration bead protruded on the reverse side of the groove when welded from the face side of the groove (one-side welding without backing materials). "Uranami" has been used in the welding field in Japan for quite some time. This term was common already in 1954, when LB-52U was developed. LB-52U is now called the "uranami" electrode, or an exclusive-use covered electrode for "uranami" welding (one-side welding without backing materials). 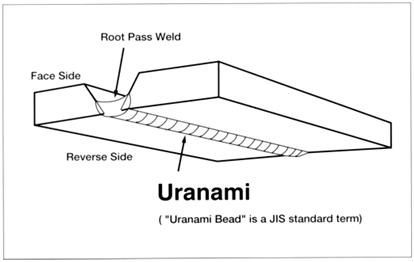 The JIS standard now specifies "uranami" bead, to mean "penetration bead." "Uranami" welding is one of the one-side welding processes, but no backing material (steel backing, refractory backing, weld backing, or gas backing) is used. Therefore, the "uranami" electrode is ready to use for one-side welding without any need to prepare backing material or equipment (backing and clamping jigs) — Fig. 2. Fig. 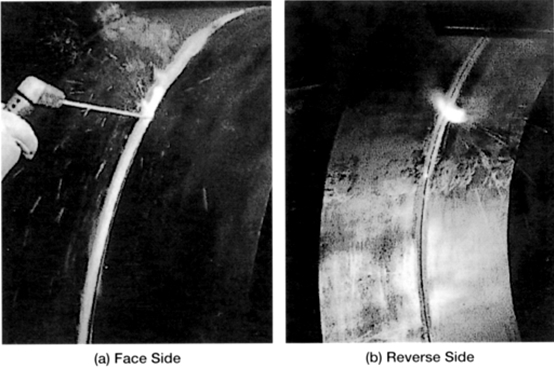 2 — The "uranami welding" process, or a one-side welding process without any backing material and equipment on the reverse side of the groove. The term, "uranami." can be used for other one-side welding procedures as well as for "uranami" welding with an "uranami" electrode in shielded metal arc welding. Any of the penetration beads can be called"uranami" in one-side welding procedures with the backing material and equipment in submerged arc welding, gas metal arc welding, gas tungsten arc welding and electrogas arc welding. "Uranami" welding offers a very economical procedure. It can save labor and material costs in the preparation of the backing material and equipment in one-side welding, and for the back gouging of full-penetration joints. "Uranami" welding, therefore, is very useful in the construction of in-plant piping systems, cross-country pipelines and tubular structures. In "uranami" welding, however, welders should use the specific techniques as stated in the column of "LB-52U in this issue. In controlling the root penetration, the protrusion, or the reinforcement of "uranami" should also be controlled within the specification you have to follow. Copyright © 1995-2012 KOBE STEEL., LTD. All rights reserved.